I’ll start at the very beginning, having heard a rumour that it’s a very good place to start. It’s April, the pavements aren’t melting, Gareth Southgate hasn’t yet stolen the nation’s heart, and the UK doesn’t know the unadulterated joy of seeing a giant orange blimp in the shape of a presidential baby. We’ve just finished our two-week rehearsal process and we’re packing our set, costumes and props into suitcases ready to whizz off to Zimbabwe. Yes, Zimbabwe. 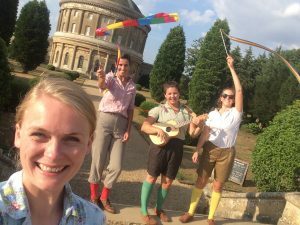 I think it’s safe to say that this isn’t how your average Summer tour of an open-air Shakespeare kicks off, but then again the Handlebards aren’t your average open-air Shakespeare company…! We started off with an incredible week of performing at HIFA (the Harare International Festival of Arts), which is an effervescent, innovative playground of music, dance, theatre, art, fashion, politics, creativity and culture. 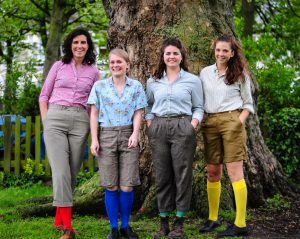 By day we performed in our very own space – The Handlebards Glade – and by night we ran riot around the festival site; dancing to every genre of music imaginable and making new friends in the Green Room. I thought I knew what it meant to be overwhelmed until we found ourselves in a crowd of thousands of festival goers, celebrating their country’s new dispensation by dancing to Freshlyground – a band that had finally been permitted to re-enter Zimbabwe after their anti-establishment music had seen them banned for years. Goosebumps and headrushes by the bucketload. After HIFA we spent a week leading workshops and performing in schools. We were consistently bowled over by the open-armed welcome that we got from everyone we met and by the passion and energy of the students. I can safely say that most British adults could learn a thing or two from those students about the beauty of Shakespeare’s language. Their reactions to the poetry and the imagery (and to the silliness and the slapstick) were vocal, raucous and heartfelt. Just the way we like it. We rounded off the adventure with a canoe trip down the Zambezi (as you do) and then we were homeward bound to embark upon our UK tour. At the time of writing, we’re three-fifths of the way through said UK tour. So far we’ve mainly ping-ponged our way around the South East and South West, performing in an eclectic array of venues; from cosy pub gardens and secret woodland amphitheatres to enormous manor houses and airy cathedral cloisters. And as if Zimbabwe wasn’t enough overseas adventure for one little travelling theatre troupe, we even briefly interrupted our UK route for an exciting jaunt to the Serbian Šekspir Festival, where we performed in their ‘Shakespeare for Big Kids’ program and squeezed in as much sight-seeing and rakija-drinking as physically possible. The Handlebards are often described as “charmingly chaotic” and we lived up to this reputation in Belgrade; our suitcases got lost in transit so we spent an absolutely frantic afternoon working out how to do the show by the seat-of-our-pants without any of our props or costume. If you’ve seen the show, you’ll know that this was no mean feat. Fate was on our side, though, and the suitcases materialised an hour before curtain up. There’s nothing quite like cutting it fine…! For the most part, mother nature has been smiling down on us (save two incredibly wet shows in Southwell and in Sevenoaks, from which I think our bones have only just dried out) and we have witnessed a level of picnic proficiency that I didn’t even know existed. We’re talking portable tables with fabric tablecloths, crystal decanters, halloumi wrapped in parma ham, quinoa salads by the bucketload and enough bottles of bubbly to sink a wandering bark (that’s a ship in Shakespeare speak). Our audiences do not muck around. 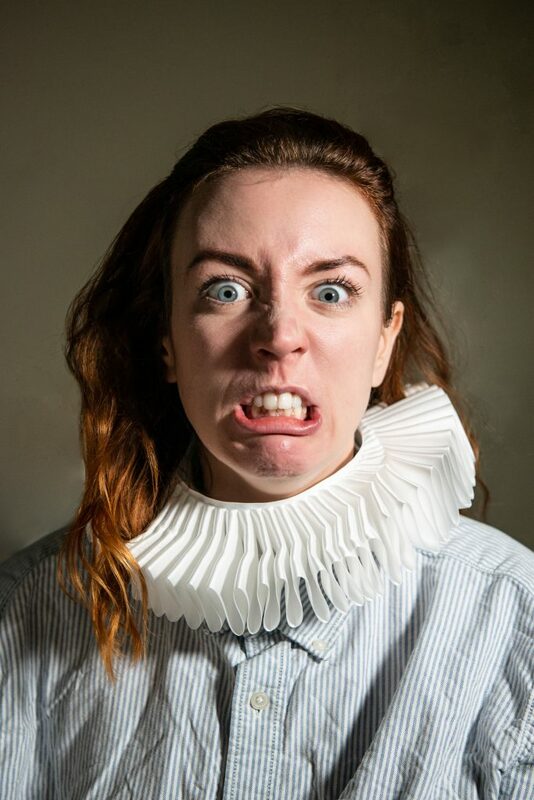 We’ve had every manner of unexpected co-star – the roaming peacocks in Salisbury, the persistent campanologists in Bretforton, as well as an uncanny number of low-flying hot air balloons – and our audiences have embraced every last minute with joy and gusto. 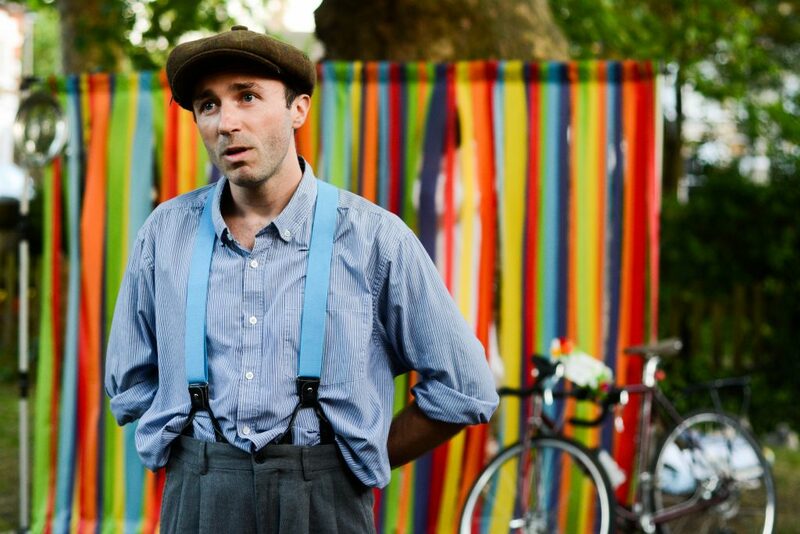 Over and over again we’re told that the Handlebards’ take on Shakespeare has opened them up to a previously unknown love of the bard. Other feedback has included “you all make really good men,” “why did you steal my wine?” and “I nearly peed my pants laughing”. I can imagine no higher praise. It’s particularly heartening to see children engaged and excited by something that is all too often written off as boring or inaccessible. See here for my favourite audience member so far. Being out on the road for weeks at time, we stay in a combination of hostels, hotels, air bnbs, theatre digs and homestays. And whilst there’s a lot of fun to be had in sharing bunk beds in a youth hostel, it’s hard to overstate the bliss of arriving in a warm kitchen to the eager offer of a glass of wine from our homestay hosts, who go from strangers to friends in the blink of an eye. Faith in humanity is affirmed every day by the enthusiasm of our audiences and the kindness of the people we meet along the way. 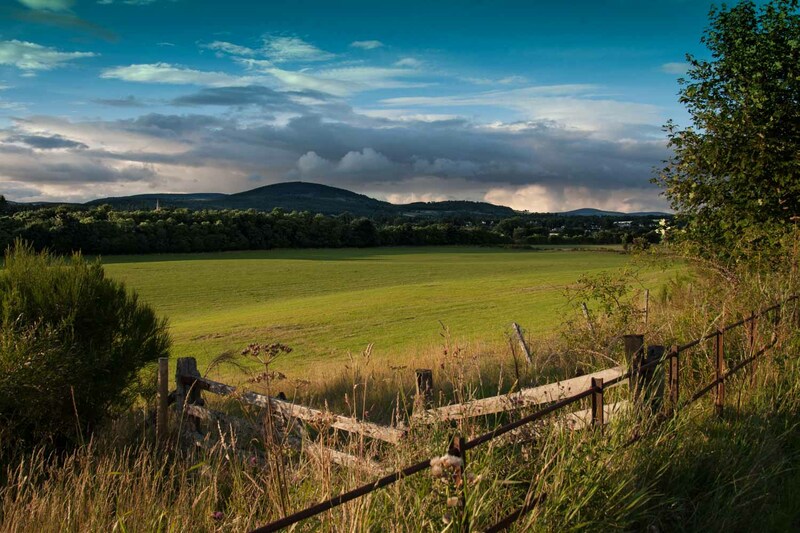 When we have free time, we keep ourselves busy by exploring the villages, towns and cities we pass through. Art galleries, museums, beaches, yoga classes, pub trips, hiking, jogging, wandering, reading, writing and jamming sessions have all become staple activities. We’re also particularly partial to consulting our Wild Swimming book for spots to let our inner water babies run free. The tidal pool at Bude is a personal highlight – fellow wannabe mermaids should most certainly put it on their to-do list. 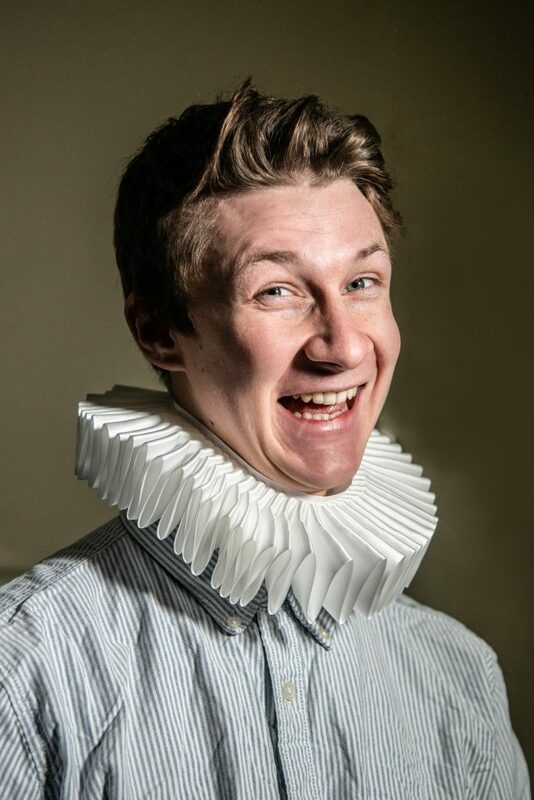 The remaining two fifths of the UK stint will be mainly spent in the North East, at the Edinburgh Fringe and all over Scotland. Fringe goers, please let us know what we should put on our must-see list and come say hi to us at the Assembly Gardens – we’re a friendly bunch and we’re partial to a beer or two. Then, in September, we’ll touch down back in London and round off the tour with a final week of shows in the capital. But that still feels like a lifetime away; there are a tonne of adventures yet to be had, a heap of new friends waiting to be met, and an absolute mountain of the bard’s words still to speak. So we’d better get cracking! You are all incredible. I laughed a lot! What about people attending your performance by bike receiving a discount. ( I saw all the posh cars arriving and people with loads a money and me on my bike- 15 quid is a lot) What about mixing the boys and girls up a bit like tonight in St Andrews which worked so well. along this coast of raiders and saints. very British, outdoor, touring ‘tale of woe’. flitter between the words and over the shore.